Glacer Sync allows you to synchronize a folder on your computer with a folder on Amazon Glacier. When you run the application repeatedly it only transfers the differences between the two systems. The application is fast and reliable. It generates a log file so you can see exactly what takes place. Amazon Glacier is a low cost file archiving service. When you upload your files to Glacier you have the peace of mind that your files will be available when they are required. To learn more about Glacier visit http://aws.amazon.com/glacier/. Note: Amzon S3 now has a Glacier storage class. By using a lifecycle rule you can push files in S3 to Glacier. SprightlySoft recommends that you use S3 instead of Glacier. With S3 you can use the AWS management console to view and delete files. See this blog post for information on how to configure a Glacier lifecycle rule in S3. Upload files to Amazon Glacier or download files from Amazon Glacier. Transfer multiple files at the same time. Resume transfers if your Internet connection gets disconnected. Send an email if an error occurs. Glacier Sync is free to use for non-commercial individual use. If you use the application for commercial or non-individual use, a license key is required for each computer the application runs on. Use the link below to purchase a license. The documentation section describes the use of the application. 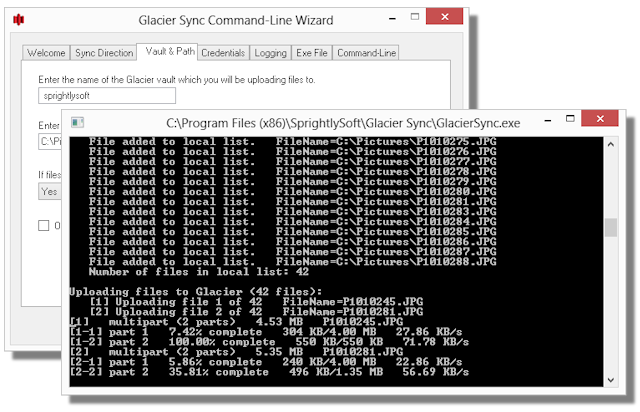 The following is a screenshot of Glacier Sync in action.